It is common for cryptocurrency ‘experts’ to constantly be giving us their top tips on the next hot cryptocurrency to buy. Want to stop depending on influencers to give you their next cryptocurrency pick? In this article I’ll show you a straightforward way to help you determine if you are buying cryptocurrencies at a reasonable price and if it’s a good time to buy. When Is A Good To Buy Cryptocurrency? As with any other asset, the best time to buy cryptocurrency is usually when everybody is panicking. Baron Rothschild summed this up well when he said “the time to buy is when there’s blood in the streets”. Why is this the best time to buy an asset? Well, it’s because investors are prone to herd-like mentality. When the market is going down, the herd are likely to oversell in panic. This crowd mentality is actually hardwired into us as humans. After all, there is safety in numbers and doing what everyone else is. Being social creatures, human have survived and thrived through collective co-operation. In cryptocurrency and financial markets, herd mentality actually harms investors. Ever wonder why you seem to be buying at the top of the market and selling before a rebound? The reason why is that you are buying when you see everyone else is buying and selling when the crowd is. Ask yourself: when you bought your cryptocurrency position, did you wait for a positive green day in the markets before buying? If so, you have done what 99% of people do and wait for a day or two of growth before feeling it’s ‘safe’ enough to invest. With such a strategy, is it any wonder why most cryptocurrency investors buy near the top and sell at the bottom of the market? In cryptocurrency markets, it is often more profitable to do exactly the opposite of what everyone else is doing. If everyone is declaring cryptocurrency is over and there are negative news headlines then that might be a good time to invest in cryptocurrency. 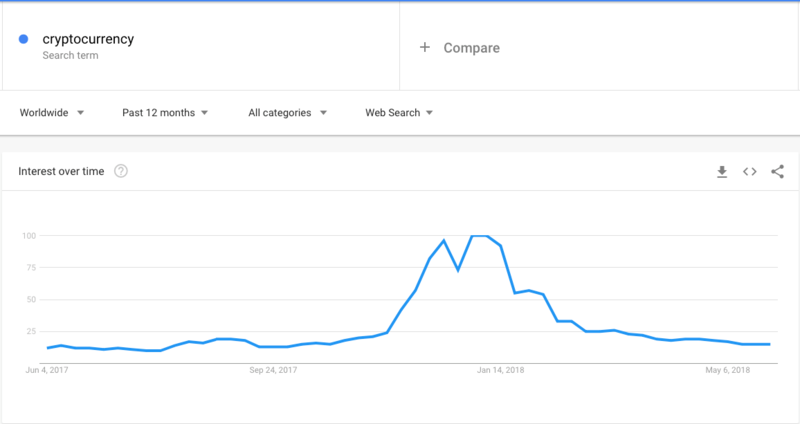 A simple way to gauge the ‘herds’ interest in cryptocurrencies is by using Google trends. When did interest in cryptocurrency peak? Late December 2017 and early January 2018. With this information, it is no surprise that cryptocurrency prices were at their highest in the exact same time-frame. An easy way to help you work out if now is a decent way to buy cryptocurrency is searching ‘cryptocurrency’ and ‘Bitcoin’ in Google trends. If the Google interest is very high, then history shows us that this is not the best time to buy. Conversely, if interest is low, then this could be an excellent entry point to make solid gains when the crowd comes back and starts investing in the market. How To Workout If A Cryptocurrency Is At A Reasonable Price? The truth is that cryptocurrency prices are not so much driven by fundamentals, but instead by investor expectations of what the project may achieve in the future. This is why a cryptocurrency with no working product can be valued at billions of dollars. The thing to know is that this is completely normal with any new technology. However, the important thing to know is that the cryptocurrency project must meet or exceed investor expectations in the future to continue supporting high price points. When working out whether a cryptocurrency is currently trading at a reasonable price, it is good to look at the prices it achieved in the past. This is something I write about often over on Total Crypto, but websites like ATHDA show you the all-time high price of a cryptocurrency. Why is this useful? Well, the all-time high price tells you the highest price point that the cryptocurrency traded for historically. If the current price for the cryptocurrency that interests you is at a significant discount to its all-time high price, then now might not be a bad time to get into it. This strategy ensures that you never buy at the top of the market. Another reason why this strategy is useful is the maths. Put simply, a 50% fall in price requires a 100% gain to get back to even. If you believe a cryptocurrency will hit it’s all-time high again, then you want to buy at as big an all-time high discount as possible. This ensures you maximize your gains if you are correct. How To Value Cryptocurrencies Against Each Other? The first thing you need to know is that the price quoted for a cryptocurrency is not very useful when determining ‘how cheap’ a cryptocurrency is. Just because you see Bitcoin at $7,500 a coin and Ripple at $0.60, this doesn’t mean that Ripple is 12,500 times cheaper. Ripple has a lower price because it has 39 billion XRP tokens in it’s circulating supply, whereas Bitcoin only has 17 million coins available to buy. With this in mind, it is no wonder that Ripple appears to be significantly cheaper. The cryptocurrencies circulating supply * it’s price = market cap. When comparing the prices of different cryptocurrencies, the market cap metric is the one to look at. For example, Bitcoin at the time of writing has a market cap of $129 billion, whilst Ethereum has a market cap of $57 billion. From this, we can tell that Bitcoin as an asset is around 2.26 times more valuable than Ethereum. One method crypto investors use to gauge the potential of a cryptocurrency is looking at its competitors. EOS is an Ethereum competitor; both cryptocurrencies allow applications to be built on top of their public blockchain and support smart contracts. An investor may believe that EOS will replace Ethereum as the number one application developer platform. They may estimate their potential return by looking at Ethereum’s market cap and what sort of returns they would achieve if EOS replaced it. EOS has a current market cap of around $11 billion and Ethereum has one at around $57 billion. This means if EOS achieved the same market cap it would generate a 418% return for investors and that’s in a down market. In the past, Ethereum has achieved an overall market cap of $133.5 billion. Cryptocurrency markets are driven by investor emotions. We hope that the simple strategies outlined in this article will help you build cryptocurrency positions at a reasonable price. The truth is that no one knows where cryptocurrency prices are going in the future. But history has shown that an effective strategy is doing the precisely the opposite of what the herd does. If all your friends are buying cryptocurrencies, maybe that’s not a good time to buy and it would better to wait until all the euphoria subsides. « Why We Need Decentralised News Now!